Speed: How quickly can money savings happen in this category? Ease: How much work will it take to save money in this category? Pain: How much will cutting money from this category be a frustration or cause hardship for the family? Now to be clear, all the categories I’m about to share should be looked at when it comes to saving money. Getting out of debt properly will require a focused examination. And they obviously will be based on personal preference. My ratings will most likely conflict with yours. However, in order to gain some positive momentum and help the family adjust to the saving money lifestyle there are some places to start that are easier than others. I’ll include a rating for each category with a brief synopsis of why I’ve given it that rating. Your kids might balk at cutting back on the money they earn for chores. So you will have to sell them on the bigger picture, which of course is mommy and daddy getting out of debt (and consequently a better life for them). In a house with four kids like ours we’d be looking at saving at least $20 a week if we enforced this. Another easy and quick win here that is relatively painless. No movies, concerts, baseball games, etc. All this will have to be cut back for a time so the money can be used for debt payoff. When you are serious about getting out of debt you shouldn’t see the inside of a restaurant. Cooking meals at home is a great way to save money. It will take some planning and adjustment, especially if you are a family who is always on the go. But the decision to not eat out can happen immediately. Potential savings impact – moderate to significant. Cutting back on retirement contributions when getting out of debt is something often not thought of. If you have $300/mo. going into retirement each month, that money if allocated differently could quickly take big chunks out of your debt. It would be easy to stop contributing, only requiring a quick discussion with your employer and perhaps the filing of some paperwork. The challenge here is psychological and emotional. We believe this action is somehow damaging our financial future. In reality, we really aren’t but we think we are. That’s difficult to work through but we should realize this is a sacrifice that should be made during the debt payoff process. One to three years of not funding retirement will be worth it to get rid of that debt quickly. When getting out of debt it’s important to look at cutting subscriptions and memberships to items like magazines, the gym and Netflix. Canceling these services will require you to make a few phone calls and you may get some pushback from the customer service reps. The pain factor is evident here as well because these are things we really do love. It will take some fortitude to commit to put these aside for awhile. These budget spending categories find themselves tagged with the “worst” label not because we can’t save money in them but rather because of the effort involved in doing so. For a family looking for a quick win in regards to saving money start with the categories above. Then once those are taken care of begin to plink away here. These will take longer to address and may face greater resistance from the family. We can quickly and easily begin to adjust the use of utilities around the home. Cutting back on gas, electric and water usage are all ways to squeeze some more money out of the budget to pay off debt. The issue here will be convincing the family when they are inconvenienced in some way. We all have our comfort level when it comes to the home environment. Who really wants to take lukewarm showers or crawl out of bed on a winter morning to a house that is only heated to 55 degrees? Oh, and speaking from experience, washing those dishes by hand will get real old after awhile. Plus the cumulative savings will not be much which will cause the family to question whether it’s worth the effort or not. Time to downgrade that cell phone plan. Cut back on the minutes. No more texting. Shelve the smartphone for a basic flip phone. This can be done relatively easily but you will have to spend some time shopping for a new phone and a plan that saves you money. Oh…and that scream you heard was from your teenage kids. And you better attend to your wife in the kitchen…she just fainted when you mentioned doing this. If you thought the cell phone was going to be a challenge wait until you suggest this one. All it will take is a call to your cable or satellite provider and some determination to resist all the goodies they will offer you to stay. The pain scale hits a 5 here though. It’s going to be awfully tough to convince the family of this one, especially since you’ve also cancelled Netflix and are avoiding all other forms of entertainment to tackle this debt. Although tough, this can be a gold mine of savings. Our family actually did cut off DirectTV for two years while we fought to pay off our mortgage early. I won’t sugarcoat the decision…it was really tough at first. But we saved around $1,000 each year. In addition, we grew to not miss it and ended up engaging in other pursuits and spending more quality time together as a family. Groceries will often be the first place people look in the budget to save money. While the savings here can happen quickly it won’t be as easy as you think. For starters you may have to change grocery stores. There are some national chains that might be significantly cheaper than the one you are shopping at. That will change your shopping experience and the availability of “your favorite items” right away. You will also have to begin spending time searching for and then using coupons. From someone who’s tried, doing that effectively requires a good deal of effort. The products purchased will also have to change. Fewer meats, more generics and less desirables like ice cream will find their way into your shopping cart. Menus will also have to change. Simpler meals and eating leftovers for a couple of nights in a row might become the norm. This type of radical change will not be a walk in the part for the family. The kids will almost certainly whine when that generic peanut butter comes home. You will be forced to plan out the weekly meals and only list what you need to buy so that your grocery shopping can be done with intentionality. My suggestion would be to ease into this one. Don’t go radical from the beginning. Start with a few basic items to save on so the family can get used to the changes. Then as the whining subsides and the family settles into the new menu plans begin to see where you can cut deeper. Ugh…who likes to tackle changes to insurance policies? It’s definitely an area we need to address from time to time but for the most part we don’t like to touch this one. Just get me a policy with low monthly premiums and get those payments on autopilot so I can forget about it. Searching for policies that save money on health insurance, life insurance, and home/auto insurance will take a great deal of time. You’ll have to compare multiple policies and balance those with your current family needs. You may even have to submit to medical exams in order to change life insurance policies. Again savings can be found here but I’d save this one for last after all other areas of the budget have been addressed. There is more money in your budget to save than you think. Some can be found quickly. Some will take more time and effort. Don’t be afraid to tackle any of it even though some of the categories seem daunting. Your focus now is on getting out of debt. Once that’s gone and money is freed up you can begin to add money back into the budget categories. After we paid off our mortgage one of the first expenditures we resumed again was cable TV. So the cuts won’t be forever. Saving money in the budget is all about going through some short-term pain so there will be long-term gain. Start looking at yours today and see where you might be able to cut expenses. If you need a budget form you can find free ones on my “Resources” page by clicking here. Questions: How would you rank the easiest or hardest places to save money? What’s the first area of the budget you cut when getting out of debt? In what other areas can you find savings? Sometimes its a contractual obligation that “prevents” you from saving in a particular area. Our cellphone/homephone/satellite/internet/cable bills total $4800 a year. The ‘early cancellation’ charges would be HUGE ! Fortunately the Canadian government has restricted cell contracts to 2 years (max.). But now there are fewer “free” phones because cell companies amortize the phone price over your full contract life. While we have cable TV internet in the city, the cottage requires satellite TV (we don’t have internet up there) and the cellphones are important where distances are measured in hours of travel. A ‘copper’ landline is much more reliable for 9-1-1 than a cellphone is, outside of major cities. Bundling is not always an option. There are just two of us in our household but we can’t agree on priorities. The real tricky part is in getting “everyone” to agree upon where to cutback. Interesting points, but I do disagree on some of them. We put off any real retirement saving while we were paying down debt. I regret it now. And people like Liz Weston say it’s one of the places you absolutely shouldn’t cut back. It can take years to get out of debt, and you’re missing out on compound interest. And due to yearly contribution limits, you can’t necessarily make that up. As for cable, we put that off for years. Also a big regret. I understand when it comes to sports coverage I guess. But we’re home all day every day, and we barely missed anything when we switched to Hulu. As for grocery shopping, that’s probably one of the best ways to find extra money. That said, I’m being a hypocrite. Thanks to some health problems, we don’t really cook. I try to supplement that with relatively affordable convenience food, but our grocery and dining out bills are one of the major expenses. I’ve had to make my peace with it, but for a lot of people you can quickly trim a surprising amount off your grocery bill each month. As for cell phones, if you can’t get rid of them, try Ting or Republic. Ting means you pay only for what you use, which might be good for a lot of people. They have a calculator on their website that lets you check. But Republic is $15 or less a month. We’re thinking about using it instead of a landline: $5 vs $36 for Vonage. Funding retirement is a sticky issue. My complete views about it aren’t represented in the post of course. In general, I’d say it’s more important to get out of debt than fund retirement. However, if the get out of debt process is going to take more than 3-4 years, then I’d try to find a way to do both – get out of debt and fund retirement a bit. You can’t go too long without funding retirement but setting it aside for a couple of years while focusing all one’s intensity on debt will be worth it in the long run, imo. Also, I wouldn’t neglect funding retirement if I could get an employer’s match. That’s free money and you can’t afford to turn that down. Eliminating restaurants and all entertainment spending was a great boon to our monthly savings rate! And, like you mentioned, relatively painless. Cutting our grocery bill down also helped out tremendously. This was more difficult, but, worth it in the long run since it’s a savings we can accrue every single month. I found your list amusing because I would have flip-flopped some of those categories! Canceling cable and switching to Republic Wireless were some of the early frugal switches we made and some of the few that have stuck! But you know, that’s okay… we need all these tips because frugality is really a tactic, and not all tactics align with everyone’s goals and values. My husband was pretty concerned about sports programming too, but we’ve found a good solution between an over-the-air antenna, using our parents’ cable login for ESPN3, and going to watch parties for important games that are not available through either previous mechanism. Just yesterday he took his traditional Sunday afternoon nap in front of the Panthers game. 🙂 I really don’t think he feels he’s missing out on anything, but then again he’s not trying to follow any team from afar. We did the antennae too and that worked pretty well. But I’m an Ohio State fan so getting their football games was a challenge sometimes here in the South. Plus I missed a lot of basketball on ESPN during the winter. The non-television habits we developed though during those two years have stuck. Now that we have cable again, I still don’t find myself watching it as much as I used to. So that’s a good thing that came out of it. That’s a great way to calculate the overall picture on savings. I think eating out can vary on household to household, but many of them are spot on. 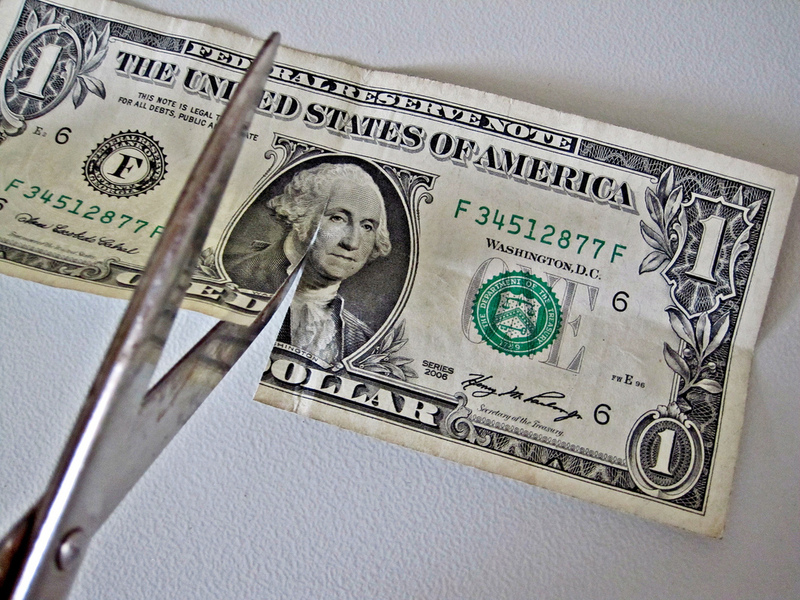 I saved a bunch of money on cutting my cell phone, cable, and entertainment expenses. “…cell phone, cable and entertainment…” Great job on that! Those are difficult to let go of. I get worried about people my age who forgo insurance or take out a super high deductible/out of pocket max insurance that they wouldn’t be able to pay if they had something catastrophic happen to them. I think health insurance is one of the most important expenses and probably the one I would push people to fit into their budgets. Entertainment is an easy one to get rid of imo, though I would have a more difficult time with it if I was single since I would want to go on dates and get “out” more. I agree DC. We have a high deductible plan and will probably raise our deductible for 2015 to cut our monthly premiums. As I’m sure you know they are set to skyrocket. But we have more than enough money saved to cover the deductible so I’m not concerned about that aspect of it. I wouldn’t advocate not having any health insurance protection of some kind. That’s one of the things that could bankrupt you if a health situation got really bad. Yes…they would rank differently. The numbers are completely arbitrary. It’s just a fun way to get people thinking about better places to start than others. As you said it’s about short term pain for long term gain. I did a whole lot of that in order to get out of debt and the beauty of it is that the frugal/money saving attitude stuck post-debt so our family hasn’t really suffered lifestyle inflation. We still look for ways to keep our spending in check or reduce it. “…the frugal/money saving attitude stuck post-debt…” That’s one cool by-product of the get out of debt journey. Our frugality is carried forward. For some though this actually could turn into a problem. They are so intense about getting out of debt and living a frugal lifestyle they don’t know when to stop, even after the debt is paid off. At some point post-debt it’s OK to relax a little and increase spending on some luxuries that could not be afforded before. I can save money in almost all areas except groceries. I think there is a point where you concede and think, “never gonna happen,” then try to move on to other areas. Never is a long time but I get what you are saying. We all have “that area” which challenges us and I’d say ours is food as well. Great tips. I found cutting back on cellphone was pretty easy for me. I some research before hand and was able to switch to a cheaper service in about 1 months time. We are just tackling the cable expense. That one was a more challenging one for us. Another area to save money is on Travel. We decided to not take vacations for about 2 years. Practical Cents recently posted…What are Escrow Accounts and Escrow Analysis? Isn’t it amazing how challenging it is for us to give up our TV? Wonder what is behind that strong reaction? Okay, I can tell this was written by a guy even if I didn’t know who you were because there is no part for clothes/personal care 🙂 Makeup and clothing run me a lot and that is on a budget! If I could nix my entire “personal care” section, I would save close to $500 / month. Haha…that’s true. I’m not focused on makeup whatsoever. But clothing is a great category to consider. Go to cheaper brands/stores. I could cut back for myself and I’m sure the Mrs. could also. But our kids are growing by leaps and bounds at the moment. My son has already outgrown the pants we bought him for the start of school two months ago. Eating out is one big factor that stops us from getting out of debt especially if you have kids. Personally, it was really a control and dedication. Back then, whenever we were in a mall with kids, it’s really hard to say no to kids. So we resorted to cooking their favorite meals and getting other forms of entertainment for kids at home. Those really worked. “Eating out…” It’s a huge factor Jayson. We are constantly on the go with the kids with sports, school and church activities. Eating out really eats into our budget numbers.